Described as a "free space" vehicle, the Fiat Fiorino Qubo has broken cover ahead of its stage debut at the Paris Motor Show next month. Marketing spin aside, the little Fiat is a five-passenger MPV aimed at young city-dwellers, with features geared more toward practicality and activity than comfort and luxury — think Honda Element or Scion xB. Priced at the equivalent of $18,200, the Qubo is offered with either a 75 HP "Multijet" engine or a 73 HP "Petrol Driven" engine, and you can shift via 5-speed stick or "robotised" 6-speed...which we assume means it's a slushbox. 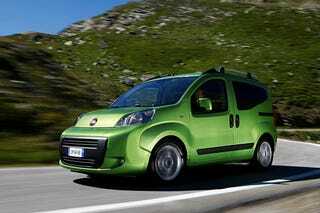 Look for the Qubo to be launched in France this month, after which it will invade Poland, Austria and Hungary. Press release after the jump. Fiorino Qubo, the new ‘free space’ vehicle from Fiat Fiorino Qubo is the name of the new car marketed by the Fiat dealer network. This original name clearly conveys the model’s attributes: it is reliable and robust, as well as being uniquely practical and versatile. And the original choice of the letter Q evokes the distinctive personality of the car as much as the rounded profile of the exterior shape. Created as a result of a manufacturing joint venture between Fiat and PSA, the Fiorino Qubo is made at the Tofas factory in Bursa (Turkey) – where the Fiat Doblò is also made - and this month it will be launched in France, followed by Austria, Poland and Hungary in July and August. It will then become available in Italy, Germany and Switzerland, and will arrive in Holland, Ireland and Belgium in October. Next year the launch will conclude in Great Britain and Denmark. Marketed in Italy with an entry-level price of around EUR 13,000, the new Fiorino Qubo is the outcome of a concept that is both simple and revolutionary. It transcends the MPV concept to embrace the idea of a ‘free space’ vehicle, capable of satisfying various transport needs, due to its distinctive personality and a practicality and versatility that are unique in its category: the Fiorino Qubo is a very practical vehicle for families, but it is also a car for young people, and customers seeking an entertaining drive. It is the ideal companion for leisure and for travelling with friends, being both environmentally friendly and fuel-efficient. In other words, with this car you can do whatever you like, just as you would expect from a multi-purpose vehicle: as handy as a city car, and as spacious and comfortable as an MPV. Indeed, the Qubo offers, at an affordable price, the same versatility as an MPV but with more compact external dimensions – it is 3.959 metres long, 1.735 metres high and 1.716 metres wide – and its turning circle is less than 10 metres. In other words, the new Fiat Fiorino Qubo is equally at home negotiating narrow town centre streets or weaving in and out of city traffic. What’s more, the Fiorino Qubo can adapt to any surroundings (urban or rural), guaranteeing considerable savings as a result of its good fuel economy (due to the 75 bhp 1.3 multijet engine) and low running costs (30,000 km before the first service). The Fiat Fiorino Qubo’s original, rational exterior style stands out due to special treatments on the side and rear that give it a sophisticated look. Likewise, the beefy, sturdy front does not detract from the general nonconformist and likeable impression that is the model's trademark. The model's look of a substantial vehicle with its wheels firmly on the ground is offset by clear, fluid lines that give it a dynamic edge. The new Fiorino Qubo really comes into its own as a unique car in its segment when you take a look inside. The original ‘free space’ concept combines six different seat configurations with a practical, regularly shaped interior. The result is a functional interior, with exceptional flexibility and use of space. For example, with the seats in normal position, the boot offers 330 litres of space (up to the parcel rack) and 650 litres if measured up to the roof. With the rear seats removed, the capacity increases to 2,500 litres. For maximum driving comfort, the Fiat Fiorino Qubo can also rely on smooth power units coupled with sturdy gearboxes. The lively 75 bhp 1.3 Multijet and the reliable 73 bhp petrol-driven 1.4 version offer outstanding driving satisfaction, optimum performance and low running costs, as well as for their great reliability and respect for the environment. For example, a 1.3 16v Multijet combined with a manual 5-speed gearbox or a robotised 6-speed gearbox guarantees excellent performance and the most efficient fuel consumption in its category: the maximum speed is 155 kilometres per hour, whilst over a combined cycle it returns 4.5L/100 km, which translates to a range of a thousand kilometres with a full tank of 45 litres. A Fiat Fiorino Qubo equipped with this power unit also proves itself to be an environmentally friendly car – some versions boast CO2 levels of less than 120g/km – and if equipped with a particulate filter, the particulate emission levels can be as low as 0.005 g/km. The 73 bhp 1.4 8v also boasts optimum performance, and could certainly be an ideal base for CNG conversions. Developed with particular attention to performance and fuel consumption, the power unit is coupled with a mechanical 5-speed gearbox and is capable of a top speed of 155 km/h despite its thrifty fuel consumption – over a combined cycle it returns 7.0L/100km. Although the Fiat Fiorino Qubo offers a simple range, everyone can still find the ideal vehicle for their lifestyle and the way they use their car. Also available as a 5-seater, the car comes in two specification levels (Active and Dynamic). Active is more basic and informal whereas Dynamic is more comprehensive with a longer list of equipment. Nine body colours and two types of trim are available. The vehicle also offers impressive features, depending on the market and version. For example, as far as safety is concerned, the vehicle offers ABS with EBD, 3 point seatbelts with pretensioner and load limiting device, hydraulic power steering, and front and side airbags. Customers can personalise their Fiat Fiorino Qubo by choosing freely between the numerous options available: 16” alloy wheels with an stylish design, aluminium longitudinal bars of up-to-date design, air-conditioning, leather steering wheel and gearstick, Blue&Me system, steering wheel controls, door deadlock, and parking sensors. Lastly, Fiorino Qubo is preparing for an original journey through the online community. From the 1st July, a Europe-wide campaign just for those who love social networking will go live at www.fiorinoqubo.com.